Guaranteed snow and long hours of sunshine, it’s not surprising Les Deux Alpes is such a popular resort. One of Europe’s most snow-sure ski resorts, Les Deux Alpes skiing is diverse and perfect for skiers and snowboarders. Like Courchevel, Alpe d'Huez and Meribel, Les Deux Alpes ski resort has brilliant apres-ski and nightlife as well as hosting the annual Rise Festival, attracting a load of music enthusiasts for a huge party in the mountains to start off the season in style. Ski holidays in Les Deux Alpes are great for skiers and snowboarders alike, with extensive ski terrain, efficient lift system and lots of sun on south-facing slopes. 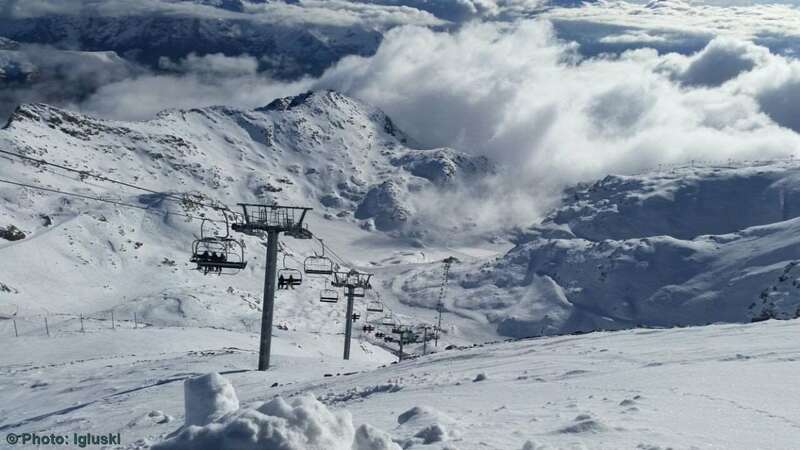 With an extensive ski terrain, efficient lift system and sunshine on its south facing slopes, Les Deux Alpes not only provides quality snow conditions and weather but is great for skiers and snowboarders alike. Its glacier at 3,600m means the resort stays open during the Summer due to its guaranteed natural snow. 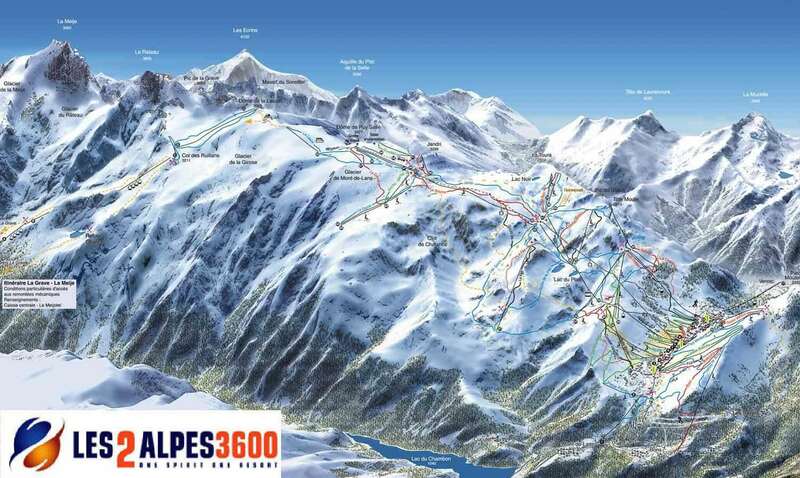 Its 200km of pistes will change in 2021 to 2023 when the resort will be linked to Alpe d’Huez creating a 3 resort area with La Grave also. There are excellent beginner slopes mostly on the glacier, making it a great place to learn and to enjoy the superb mountain views. But it also gives beginners a chance to explore the resort’s terrain rather than just being limited to the nursery slopes at its base, something that does differ to the usual French ski resort. Intermediates have variety but it is advised less confident intermediates and beginners take the gondola down to the centre as the runs on the way down tend to be steep and icy. For experts, Les Deux Alpes isn’t the most demanding of resorts so should test their ability on the off piste runs of legendary La Grave with a guide when the conditions are right. Easypark - an area dedicated to beginners with a selection of features including boxes, a half pipe and small tables. Slopestyle and Big Air area - an area with large features. The resort is very snowsure due to its glacier skiing. There are also many snow making facilities across the pistes which contribute to the natural snowfall of the high altitude throughout the season. Les Deux Alpes is known for its lively party atmosphere with après skiers partying from afternoon to late in to the night. Apres-ski fun starts on the mountains after a day of skiing with various bars and restaurants to choose from some with live music and seating outside. Enjoy outstanding panoramic views of the surrounding snowy peaks with a cold beer - the best bars are Pano Bar, Umbrella Bar, Yeti Bar and Red Frog Bar. But the party doesn’t stop in the town with more places to enjoy apres-ski entertainment. If you’re looking for a quieter evening, guests can enjoy the local mountain cuisine in one of the many restaurants in town all serving great quality food with exceptional service. For non skiers there are also plenty of activities to get involved with including a heated outdoor swimming pool, outdoor ice rink and sports centre. The resort offers a tanking centre with flotarium, sauna and Turkish baths to help relax any aching limbs at the end of a hard day’s activity. Chalets in Les Deux Alpes are great for families and groups of friends. Choose from our wide range of chalets in Les Deux Alpes which offer catering and location convenience. Our hotel options are also popular. Whether you're on a budget or looking for luxury, we have Les Deux Alpes hotels – bed and breakfast or half board to suit you. Les Deux Alpes is a fantastic choice for everyone, it&#39;s just under 2 hours from Grenoble but it&#39;s still a snow sure resort with a glacier! Pano Bar and Umbrella Bar are perfect for Apres. The Spot is an amazing place to eat, I had breakfast and dinner here and would highly recommend. There&#39;s a great selection of hotels, self catered apartments & chalets - so plenty of choice! Le Diable 1. A great snow-sure piste for all with easy access thanks to the high speed Express Diable lift starting in the resort and climbing to 2,400mtrs. From the top skiers peer down to the resort which suddenly looks very small. The impressive scenery takes in another massive vertical drop of another 800 metres from the resort centre all the way down to the valley floor and Venosc. This is flanked by the majestic Meije peaks giving the resort it’s well-earned name of Deux Alpes.